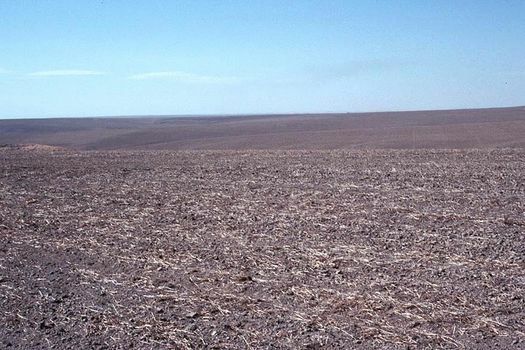 The phrase "bonanza farming" usually refers to the huge wheat farms that developed a century ago in the Palouse Hills of southeastern Washington State. 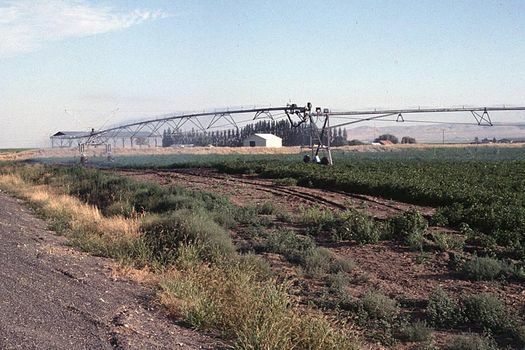 Those hills are still in production, but to their west lie the even more productive irrigated lands of the Columbia Basin Project, only half-finished, never even remotely likely to be finished, but still irrigating a half-million acres. The soil here is mostly fine-grained silt, laid on massive flood basalts. 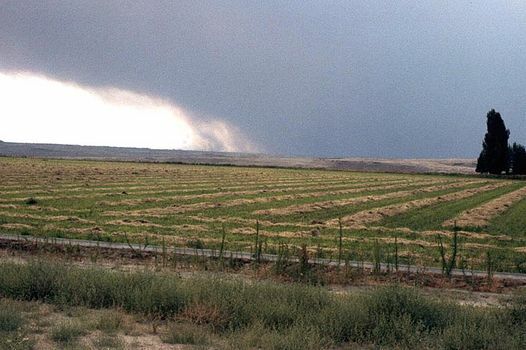 When a tractor passes on a breezy day, a plume of dust can be seen from miles away. 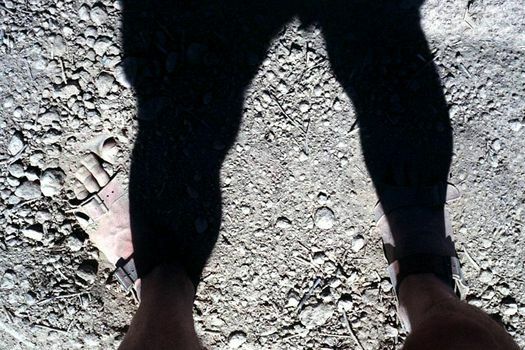 The toes on the left side were getting pretty hot when this picture was taken one summer day. This land could be irrigated; in the 1950s there were plans to irrigate it. 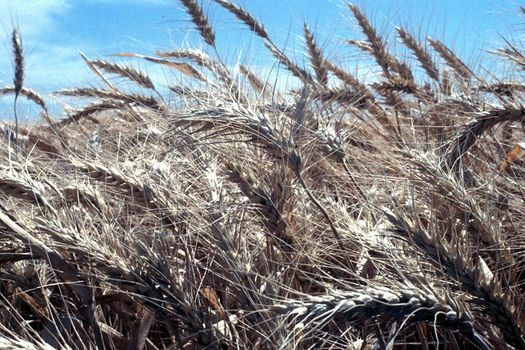 Spoil-sport economists put an end to those plans, however, and the land remains dryfarmed. 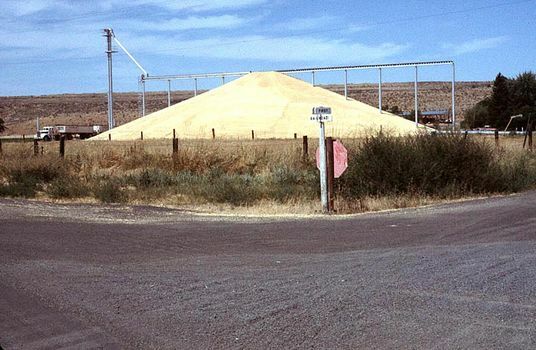 Where to put the wheat that grows here? Elevators are expensive, and railcars are scarce. 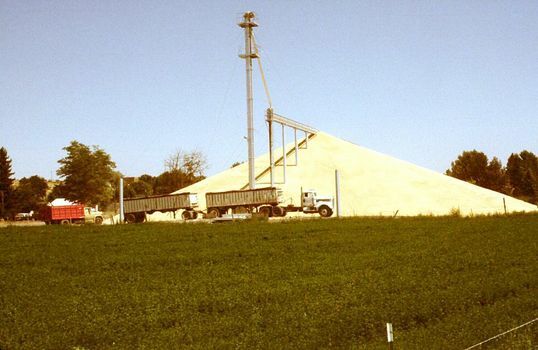 Pile 'er up. Wand a higher heap? 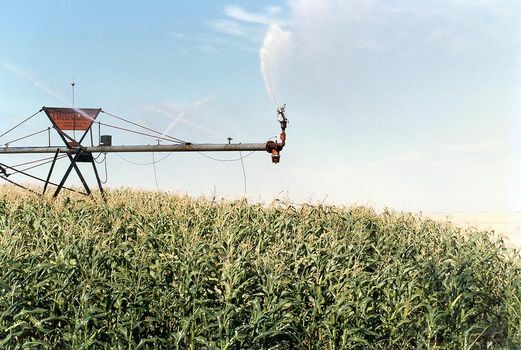 Get a taller auger. 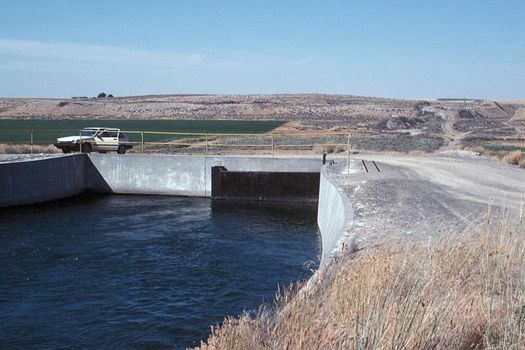 Part of the Basin, however was reclaimed in the 1950s by the Bureau of Reclamation, whose Columbia Basin Project lifts water from the Columbia River at Grand Coulee and runs it through a huge system of canals. Here the main canal divides ("bifurcates" in the jargon) into eastern and western branches. 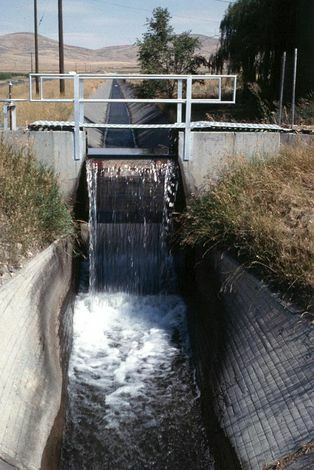 The east branch enters a siphon, shown here, with the far end visible in the background. The fine rental car helps date the picture. Periodic drops keep the branch canals almost level. The Mercedes-Benz of field channels: massive concrete. Plastic checks pond the water, which is drawn off in siphon pipes like those piled in the left foreground. 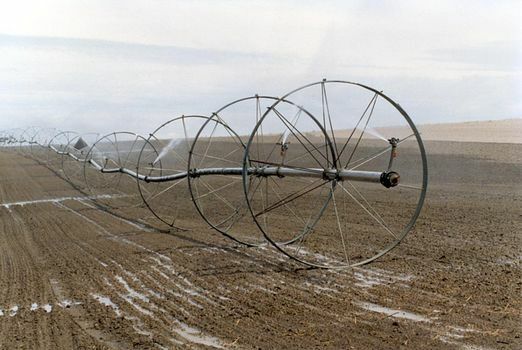 This is furrow irrigation, and it works well if the land if flat and not too sandy. Too much sand? Uneven land surface? Then sprinklers may be the answer. 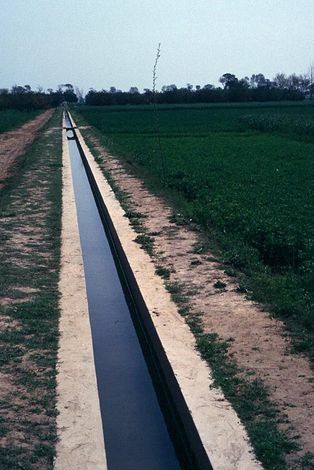 Here's an obsolescent side-roll system, which draws water from a ditch at the other hand. State of the art: a center-pivot sprinkler with an articulated tailpiece to reach the corners of the field that otherwise would stay dry. A big-gun sprinkler covers a lot of ground at the far end of the sprinkler line, which of course moves much more quickly than the pivot end. Telltale center-pivot tracks in a wheat field. 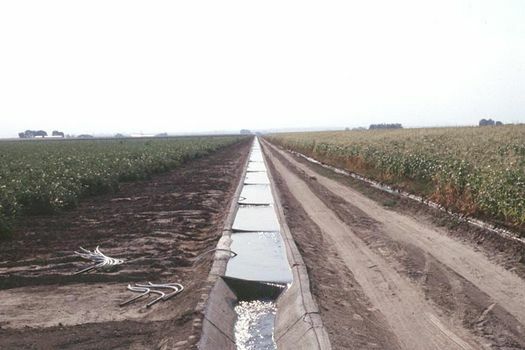 None of the planners of this irrigation system dreamed of using their precious water on grain. 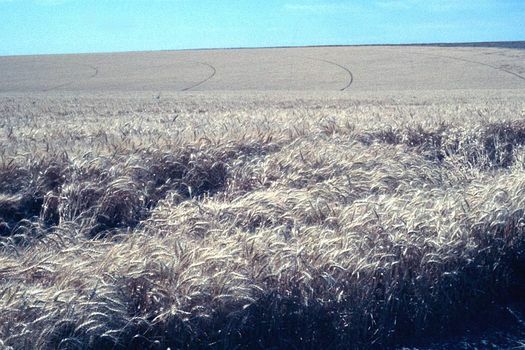 Yields are extremely heavy, so much so that the post-harvest straw is too abundant to plow under. 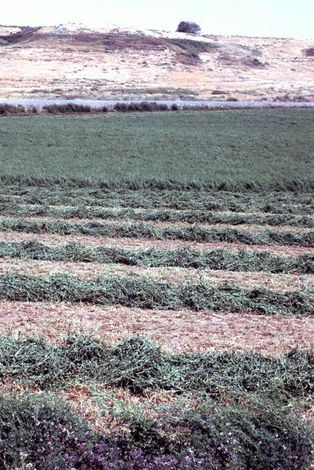 Alfalfa's another common crop, though rain looks about to spoil the drying windrows. A closer look at a partly cut field. 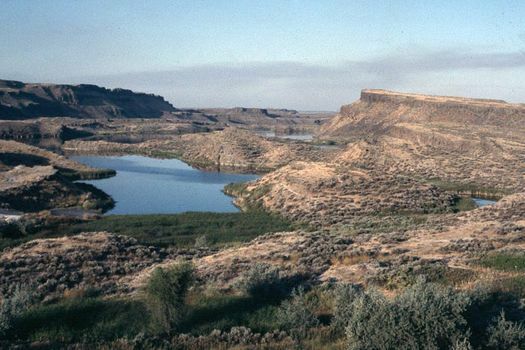 In the background, some rough ground, a reminder of the flood basalts that cover the Columbia Plains. 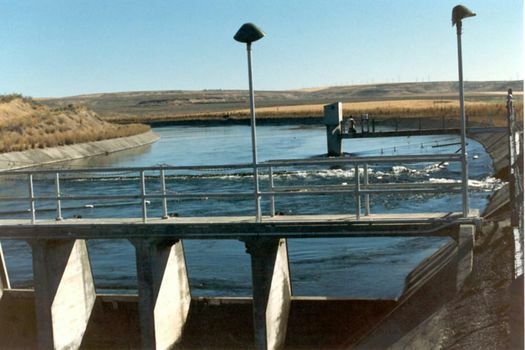 Though full of waterfowl, Moses Lake is an artificial pond formed by seepage water from the irrigation project. The flood basalts underlying the basin like stacked pancakes are nicely revealed on the right. 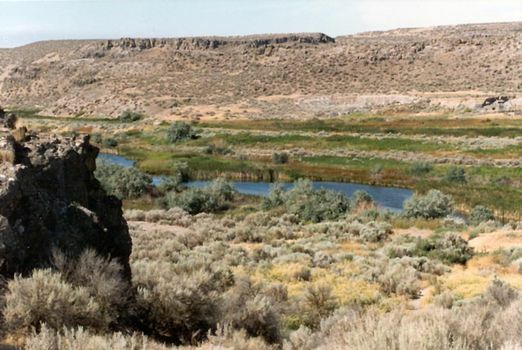 The pioneers never saw such water threading through the coulees.